Darlac Compact Shear deals with a heavier growth. Features precision tensioned, rust-resistance blades, made with the SK5 Japanese Carbon steel and the soft, ergonomic, non-slip handles. 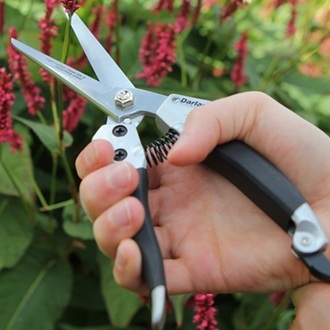 With longer and broader blades than the Snips it can deal with heavier growth. Features precision tensioned blades for a clean cut. The blades are made with the SK5 Japanese Carbon steel and are rust resistant. Can be easily sharpened using Diamond Sharpener. The soft, ergonomic, non-slip handles are comfortable and safe to use. The easy to use catch at the bottom of the handles can be operated single handed against the body, leaving your other hand free. Weight: 180g, Overall Length: 220mm. Safety: Please note that this product is not for sale to people under the age of 18. By placing an order for this product, you declare that you are 18 years of age or older. This item must be used responsibly and appropriately. Keep out of the reach of children. Always store in a safe place, when not in use. Take extra care when using.